Random And Some: "You don't feel like smiling? Then what? Force yourself to smile"
"You don't feel like smiling? Then what? Force yourself to smile"
Last week I read Everything I Never Told You (2014) by Celeste Ng, a Pittsburgh, Pennsylvania native whose parents move from Hong Kong to the USA in the late 60's. I found the book via BuzzFeed's The 24 Best Fiction Books of 2014 and immediately added it to my Christmash wish list because I very much liked the accompanying description. Thanks Katrien for getting it for me! Cool fact: Ng spent 6 years writing Everything I..., going through four different full drafts. 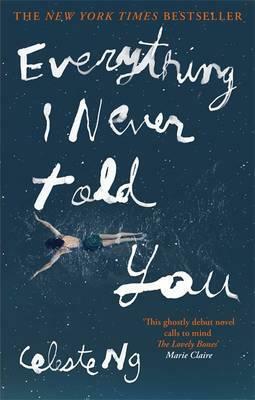 Everything I Never Told You tells the story of the mixed-race Lee family, with Chinese father James and white mother Marilyn parenting three children: Nathan, middle child Lydia, and latecomer Hannah. When Lydia goes missing and after several days is found dead in the town lake, each member of the family is forced to confront its fault lines and fractures. As James and Marilyn reflect back on their lives, we learn that they have transferred their hopes and dreams onto Lydia, completely overbearing her. What a debut! On her first try Ng delivers a profoundly moving family drama filled with secrets, sensitivy and longing. Everything I Never Told You is a gripping page-turner, showing the many ways in which mother and daughters, fathers and sons, and husbands and wives struggle to understand one another.